You know when you go home, and there are just some things that you can’t find anywhere else? There are a lot of those things in Pittsburgh, and this is a list of just some of them. 1. 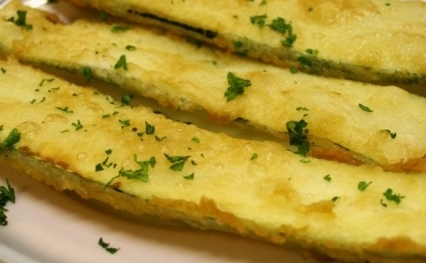 Fried Zucchini: This must exist in places other than Pittsburgh, but it can’t possibly be around in the frequency and quality that “the burg” allows it. Long strips of zucchini are battered and fried, dusted with parmesan cheese, and served with a cup of marinara sauce as an appetizer. It is exactly what it sounds like, and it is good. The secret is pretty much out on this place, and it turns out a lot of flyover states have a version of a sandwich that includes side dishes between the bread, but we like to think we were the first (maybe we were). Regardless, it’s a good, albeit heavy sandwich. 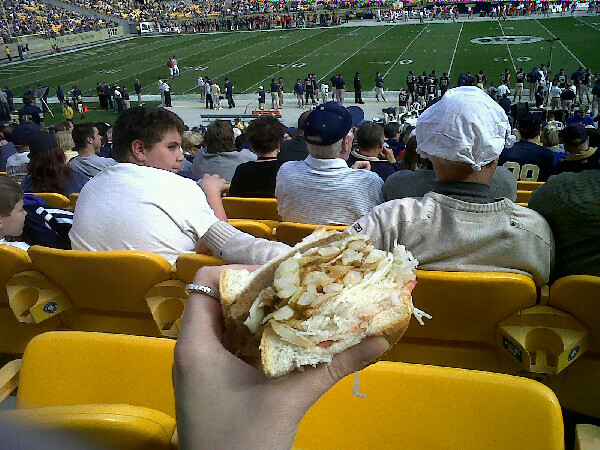 Eaten before a Steelers game (or AT a Steelers game at the new-ish stadium), your stomach is fully lined for beer. 3. Pecan Balls: I thought this was a Pittsburgh thing until I saw a recipe for it on Food Network. 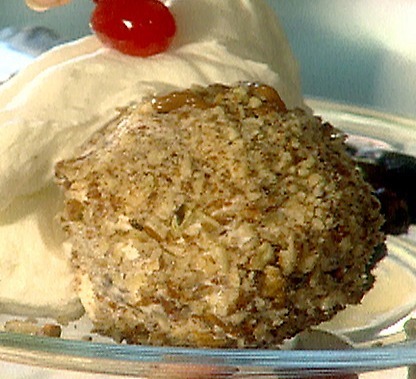 No matter- the point is that every good Steel City restaurant has a pecan ball on its dessert menu. Ice cream rolled in pecans, sitting in whipped cream, topped with butterscotch or chocolate. Yum. 4. Eat ‘n Park: If you live in the Northeast, it’s called Friendly’s. If you live more toward the Mid-Atlantic, it’s called Howard Johnson’s. Whatever you call it, it’s a diner chain with cheap, greasy spoon food and bottomless coffee- but at Eat ‘n Park, you can also get a famous Smiley Cookie. 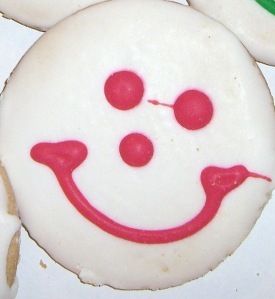 Whether you’re a high school student driving around at 2am with nothing to do, or a 30 year old relishing a breakfast plate for $3, the Smiley Cookie is for you, in all of its diabetic coma inducing sweetness. And while we’re at it, Eat ‘n Park is responsible for my favorite holiday commercial ever. a) “Pittsburgh style” steak: If you ask your server what “Pittsburgh style” is, they will tell you that it means the steak is prepared very rare on the inside and burned to hell on the outside. Why anyone would want to eat this style of steak, I don’t know. b) Steak Salad: Iceberg. Tomatoes. Carrots. Shredded cheddar cheese. Steak. French fries. Ranch dressing. All mixed up in one bowl. Or, if you are lucky, a huge taco shell. What’s not to love? Technically this is a chicken salad, but it is the same idea. Pittsburghers, what’s your favorite hometown food? ← Frame: Try the library? 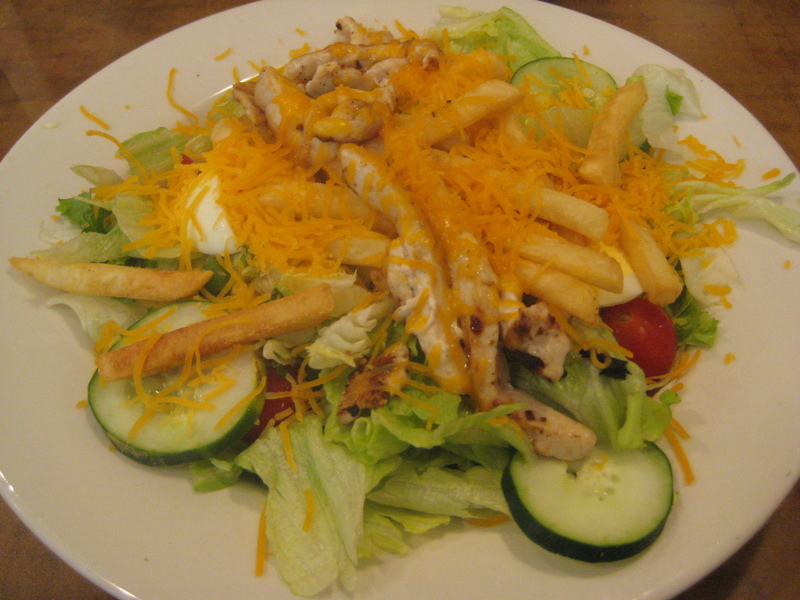 I love the grilled chicken/steak salad with frenchfries! I was so disappointed after I moved south to discover that it was a Pittsburgh thing. Now I just order a side of fries and put them on top, and everyone looks at me.